Thanks to Peter Cohen for providing this insight into the connection between Feldenkrais and Yoga. Peter Cohen is a senior yoga teacher in 3 separate yoga traditions, having imbibed the yoga lifestyle for most of his adult life. 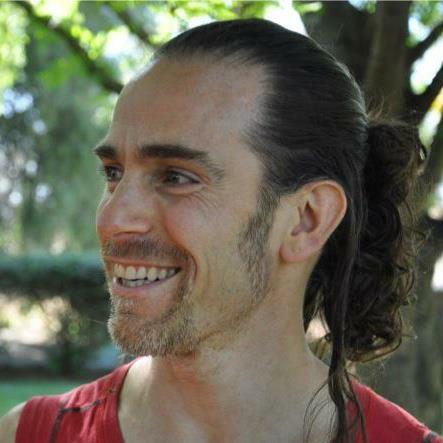 He is also something rather unusual amongst yoga teachers in that he is also a certified Feldenkrais practitioner (graduated Melbourne 2008) and his Feldenkrais understanding enriches his teaching of yoga. He regularly offers a variety of yoga classes, workshops, training and retreats in Melbourne, Bali and Fiji. You can find him online at ATYOGA.ORG or by searching for yogipete on Facebook. The reference to 'Moshe' in the writing below refers to Dr Moshe Feldenkrais (1904-1984) who was a physicist and engineer. However it was a crippling knee injury, combined with an interest in martial arts that inspired him to devise the Feldenkrais method. Because the yogic philosophy of non-seeking has been devalued in the modern commercialised yoga context I believe it is nowadays easier to be be initiated into the profoundness of movement and sensing via a Feldenkrais lesson than via your average fitness-based yoga class. Feldenkrais lessons help a yoga student by providing them with a direct irrefutable experience of how deeply interconnected our perception and movement are. Once a yoga student grasps this crucial interconnection their yoga practice can blossom -- becoming more like a dance of life, and less like exercise. Feldenkrais experiences are also useful for yoga teachers. Particularly those who may have unwittingly removed chanting, visualisation and sincere heart-based practices from their yoga classes. A key thing for prospective yoga teachers to learn on the teacher retreats I offer is that yoga practice is actually a manipulation of awareness and perception, not merely a manipulation of body and breath. Feldenkrais lessons provide a yoga teacher with an emotionally safe experience of what is possible when we attend to ourselves in new ways and put more value into playing with the nature of our self-attending. In this way Feldenkrais lessons liberate a yoga teacher to reassess and explore what happens to their yoga when they do things like chant while moving, or add visualisation, or offer a new depth of sensory and emotional sincerity to their classes. I also believe that yoga is a great complement to Feldenkrais lessons for those interested in spirituality. What yoga offers a Feldenkrais student is the possibility to turn the Feldenkrais experience into a deeper personal spiritual exploration. I understand Moshe really resisted this notion, yet it has come up time again with my fellow Feldenkrais practitioners and many have asked me as a senior yoga teacher whether I believe they fit together. I believe they do. I believe Feldenkrais and spirituality are much closer than Moshe liked to believe and that although Moshe borrowed some ideas from yoga, he seems to have resisted borrowing more. Outside of our personal preference I don't see any other reason why not. I would love to know more about how other Feldenkrais practitioners feel about offering Feldenkrais and spirituality together. I know there's already been past examples of this and I imagine it's a sensitive issue given Moshe's opinion on the matter. Some of my Feldenkrais friends seem to be almost waiting for permission to put them together. I don't think there's anything against it from the perspective of the yoga world. Instead of enlightenment, you could call it Feldenment.